We’re not exactly party animals, Alan and I. What did we do the entire bank holiday? Stay at home, cook our meals, sleep in, rest, get over our individual viral infections (it sounds a lot worse than it really is) and suffer hay fever in silence. But when I have the time (and the inclination), I try recipes I’ve been wanting to try for absolutely ages. I’ve been looking for an easy Chinese steamed sponge cake recipe for ages. Ever since I impulse bought a slice of steamed sponge cake from Kowloon Bakery in London Chinatown. By absolute chance, because there was nothing on telly last Wednesday (nothing we wanted to watch anyway), we turned the telly to the Food Network and saw an episode of Poh and Co, Poh Ling Yeow’s cooking (and lifestyle?) show that’s produced for Australian TV. But you do get weird and wonderful shows on the Food Network so because it sort of reminded us of Chinese cooking, we just left the telly on the Food Network. As luck would have it, Poh Ling made her version of Chinese steamed sponge cake and it looked so easy I had to try it. And try it I did. The recipe is fairly straightforward and easy. It consisted of 5 ingredients that any baker would have in their larder – just flour, baking powder, eggs, and vanilla extract. I think I benefitted from watching Poh make the cake so I knew exactly what I was doing. But I was so pleased at how it’s come out: so soft and pillowy and so very light! It’s so deceptively light that Alan and I managed to consume more than half of one of the two cakes that I made! 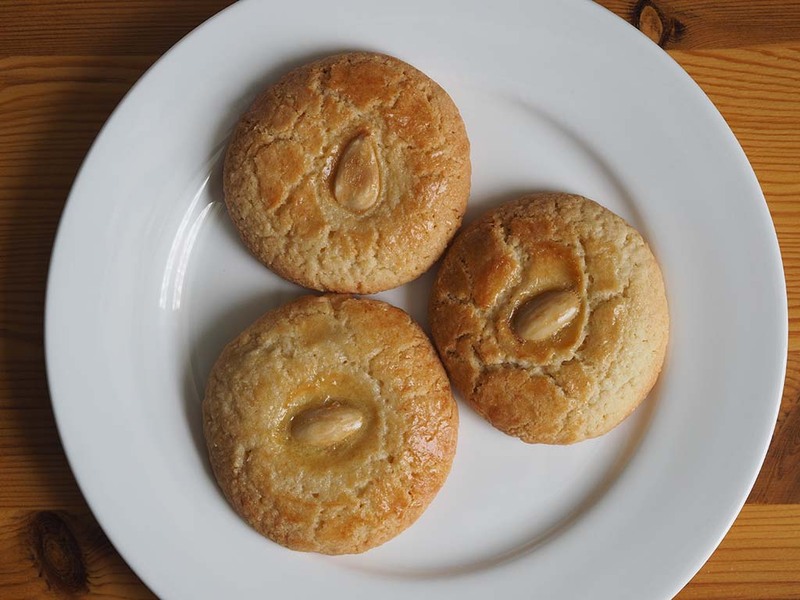 Almond cookies are a staple both in Chinese bakers and in Chinese kids’ childhood memories. Everyone has an almond cookie experience that makes them smile (or at least that’s what I have been told). Alan’s recipe is very similar to mine and this recipe was posted on our Pan-Asian Kitchen blog and I am sharing this with you on Yellywelly. Text, photos and food fluffing all by Alan. I always remember eating almond cookies in one form or another since I was young and even though I did like them, none of them were memorable until about 16 years ago when I got the opportunity to go over to Canada for 6 weeks (around the Christmas and New Year holidays) to spend some time visiting my aunts and uncles whom I had not seen since I was very young. A small issue I had was that I had started a new job a few weeks before the trip and had to explain to my boss (James) about the trip that was planned. As well as letting me go on the trip, he lent me a suitcase and gave me a lift to the airport on the day I flew out. Amongst the gifts that I brought back, I purchased several boxes of Chinese Almond Cookies from the Market Village Chinese Mall to say thank you to James for his help. I kept a box back for myself so that I could try the cookies and found that they were the most delicious almond cookies that I had tasted. Looking around Chinatown in London, I could not find almond cookies that looked like the ones I got from Canada. I even tried the ones from the Chinese bakeries but they did not look or taste the same as how I remembered them. 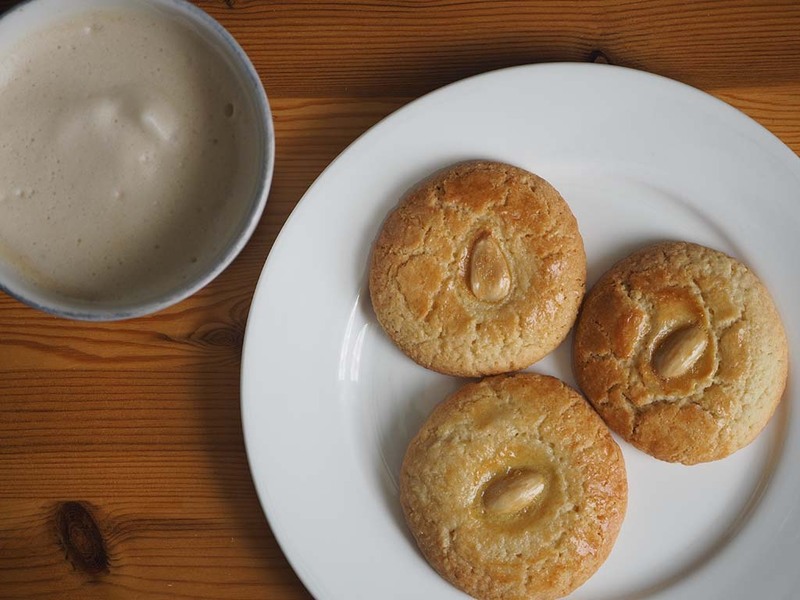 Several years had passed and I was teaching myself to bake new things and remembered back to the almond cookies that I purchased from Market Village. I had a look around for recipes for almond cookies and they all seem to have the same quantities of butter, flour and sugar but the almond flavour didn’t come through enough so have doubled the amount of ground almonds and added almond extract to give them an almondy boost. So after a few attempts of perfecting the recipe, here is my take on the Chinese Almond Cookie. This cookie is great for a treat or to give as a present to friends or family. 1. In a bowl, cream together the butter, sugar and salt. 2. Add the egg and almond extract and mix together. 3. Slowly add the flour, the baking powder and ground almonds into the mixture. To do this, add a few dessert spoons of the dry ingredients at a time and combine together. Repeat the process until it is all mixed well. 4. Preheat the oven to 180°C/360°F (170°C/340°F if using a fan oven). Line a couple of baking trays with baking paper and then divide the mixture into 24 equal sized balls which are roughly walnut sized. To help potion off the mixture evenly, I used a sized 40 ice cream scoop and levelled it off with a spatula but you can do it by eye if you do not have a scoop. 5. Put the cookies dough balls on the baking trays (leave a 1” gap between the cookies as they do spread out slightly, you may need to bake in several batches if you use smaller baking trays) and use a round measuring spoon to press an indentation in the middle of the ball (in this case, I used a 1 tsp measuring spoon as the blanched almonds just about fit inside). By using the measuring spoon to press the indentation into the ball, it will also flatten the ball into a cookie shape. If you do not have a round measuring spoon, flatten the ball with your hand and make the indentation with your thumb. 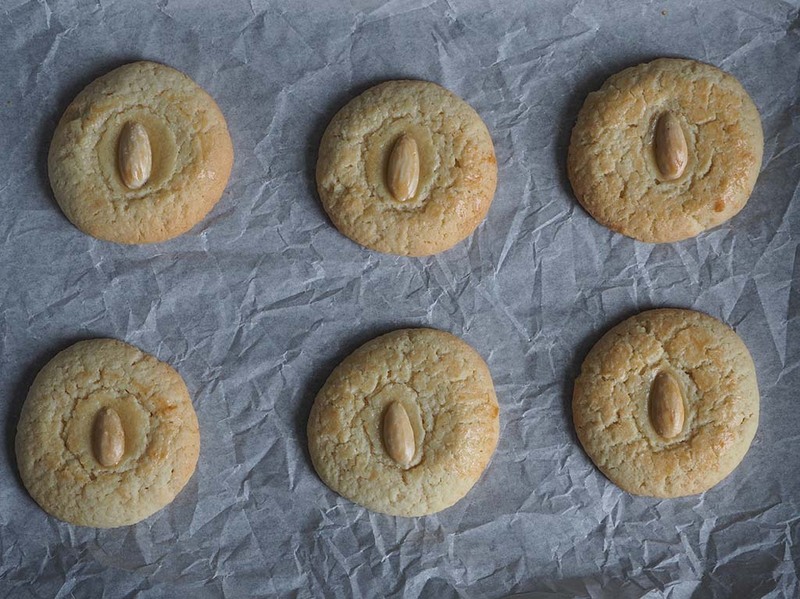 Put a blanched almond or a slice of almond into the indentation of each cookie. 6. 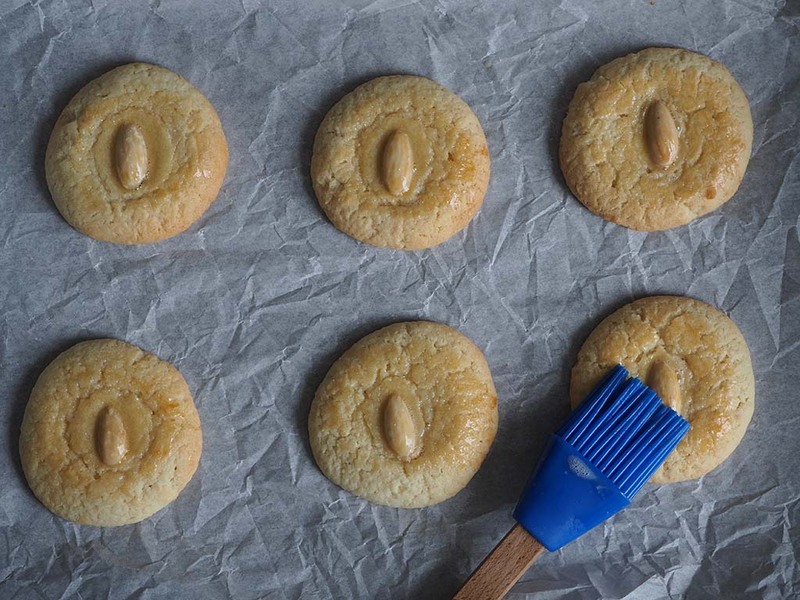 Brush each cookie with the beaten egg. 7. Bake the cookies for 10 minutes or until the cookies are a lightly golden colour. Allow cookies to cool down for roughly 10 minutes. Reduce the oven to 160°C/320°F (150°C/300°F if using a fan oven). 8. 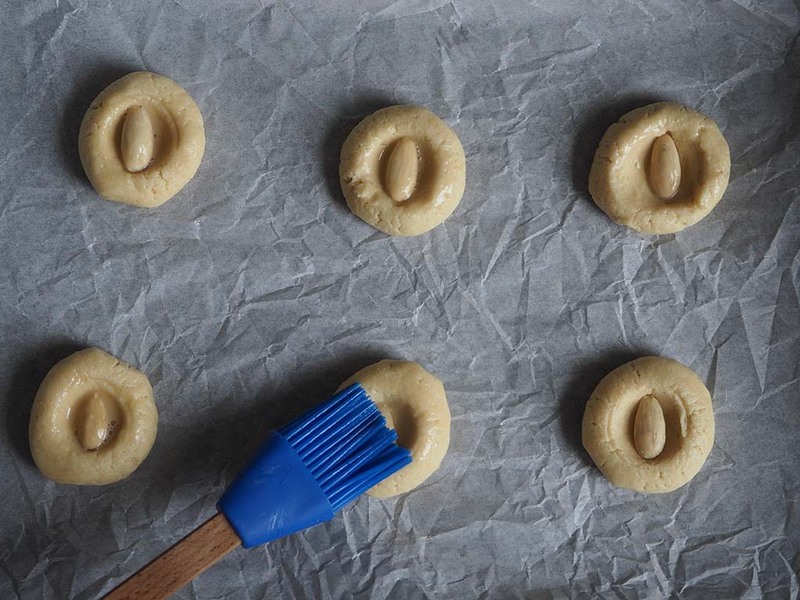 Brush the cookies with more beaten egg and bake for another 10-15 minutes or until they turn golden brown. Allow to cool down completely before storing in an airtight container. This was one of Alan’s posts on our shared blog the Pan-Asian Kitchen. He does have brilliant ideas and I am so proud to share with you his recipe for this Chinese bakery staple. The text, photos and food styling are all Alan. There have been times that I have gone into a Chinese bakery in London and fancy trying something new. A couple of months ago was one of these times. I was a bit tired, a little hungry and wanted something different to eat. I have always seen the hot dog buns that the bakeries had to offer but didn’t pay much attention to them as we normally just got some of the Char Siu Bao (BBQ Pork Buns) to take home. The hot dog buns that I spied didn’t look anything special as it essentially was some flattened dough with a hot dog plonked on it topped with mayonnaise, ketchup, cheese and some vegetables (spring onion or carrot or peas) This bun is then baked in the oven until the cheese melts, the sauces reduce, and the vegetables caramelise. 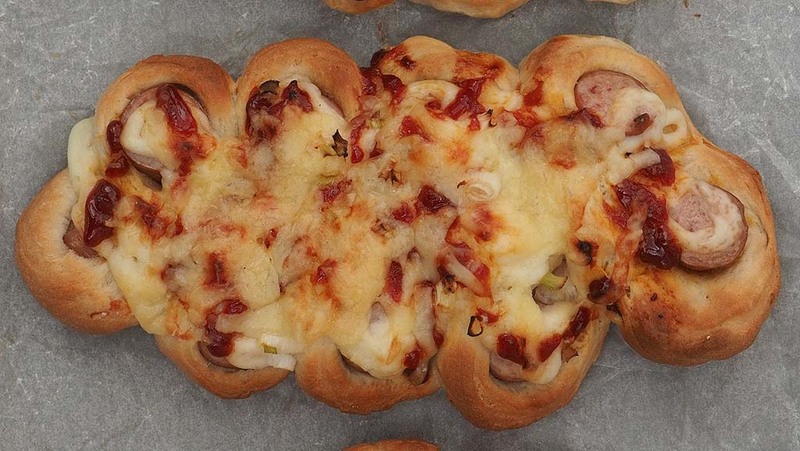 The resulting bun is a very tasty treat that is far far better than making up a normal hot dog in a finger roll and then putting the sauces on top. 1. 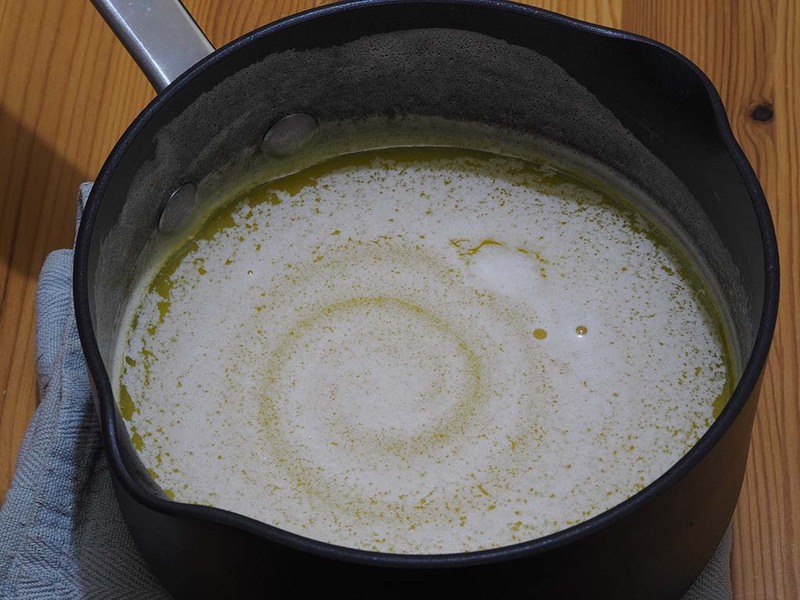 Put 65ml milk, 35g granulated sugar and 60g of butter in a saucepan and heat until the milk starts to boil. Turn the heat off and stir the mixture so that the butter melts and the sugar dissolves into the milk. 2. In a microwaveable jug or bowl, put the 65ml of milk and 1 teaspoon of sugar and heat in the microwave in full power for 30 seconds so that the milk is lukewarm. 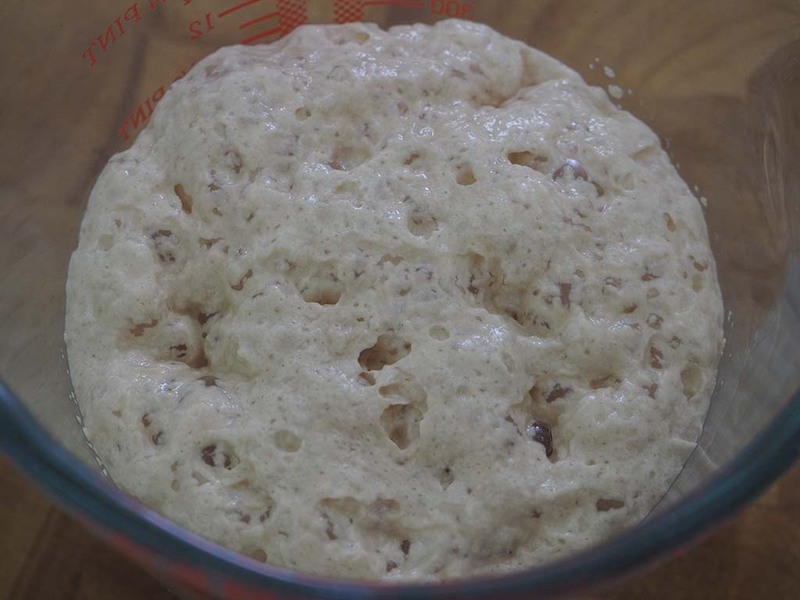 Stir in the yeast and leave for 10 minutes until the mixture foams up as the yeast activates. 3. 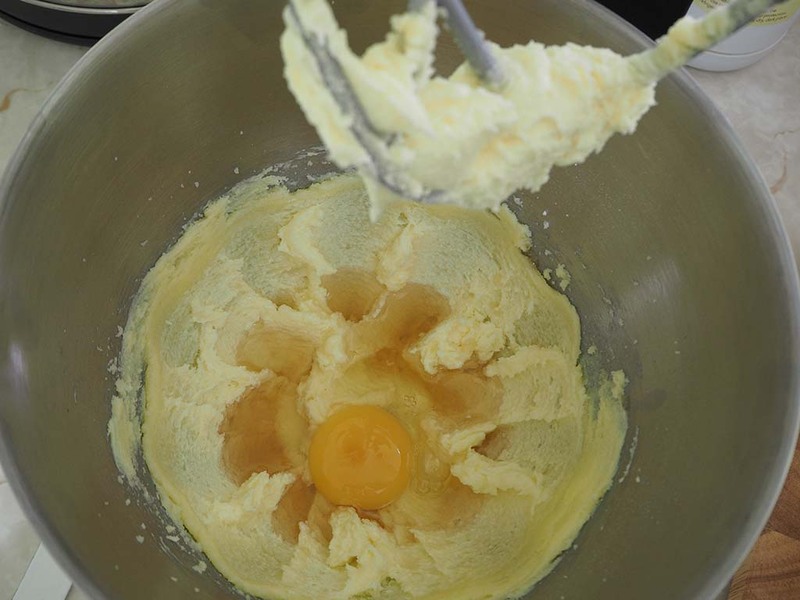 In a mixing bowl, add the yeast mixture, the butter mixture and the egg. Mix the wet ingredients together and then spoon in the flour, mixing as you go along. 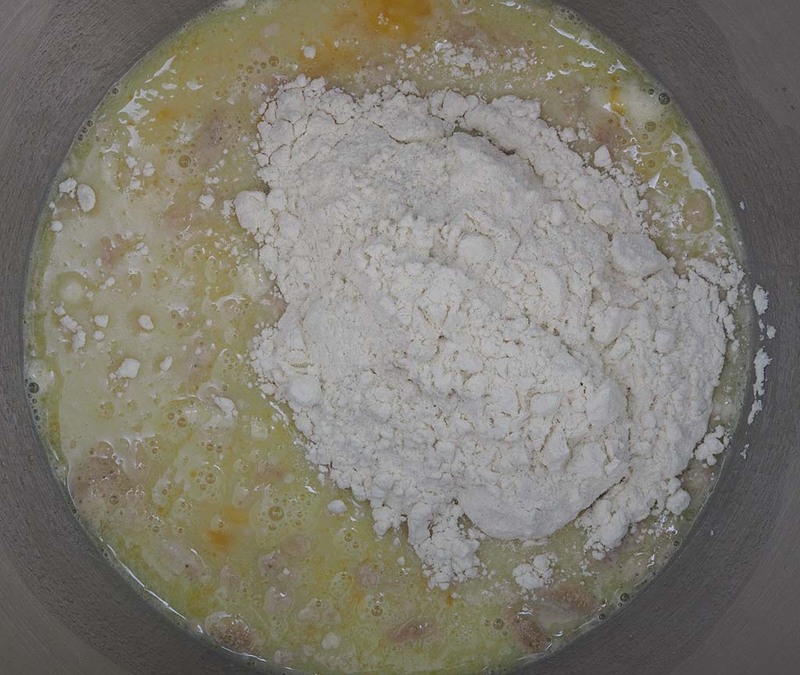 Keep going until all the flour has been mixed in and the mixture has turned from a batter into a dough. 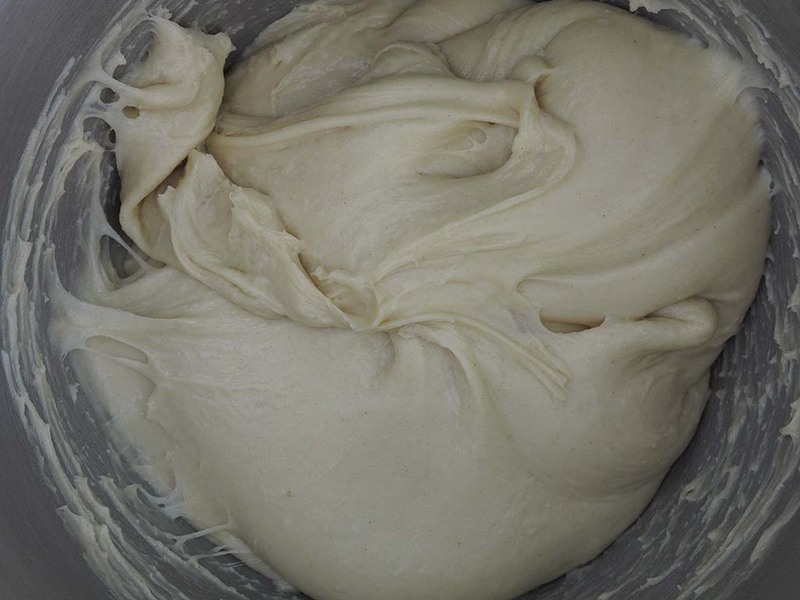 If you are working the dough by hand, tip the dough out onto a lightly floured work surface and kneed for about work the dough for about 10 minutes. 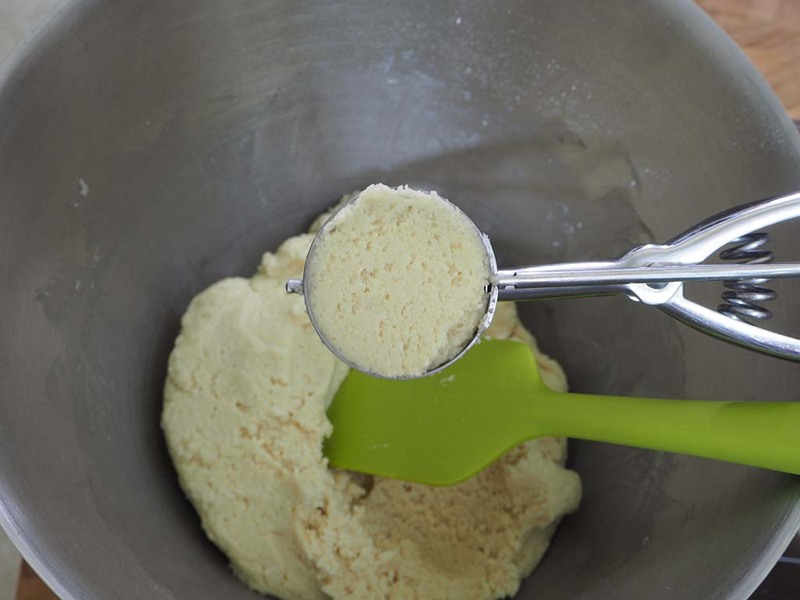 If using a stand mixer, mix for 6 minutes on a medium-low speed. The dough is ready when you can pinch some dough and stretch it quite far without the strand breaking. 4. Oil a bigger mixing bowl and tip the dough into it. 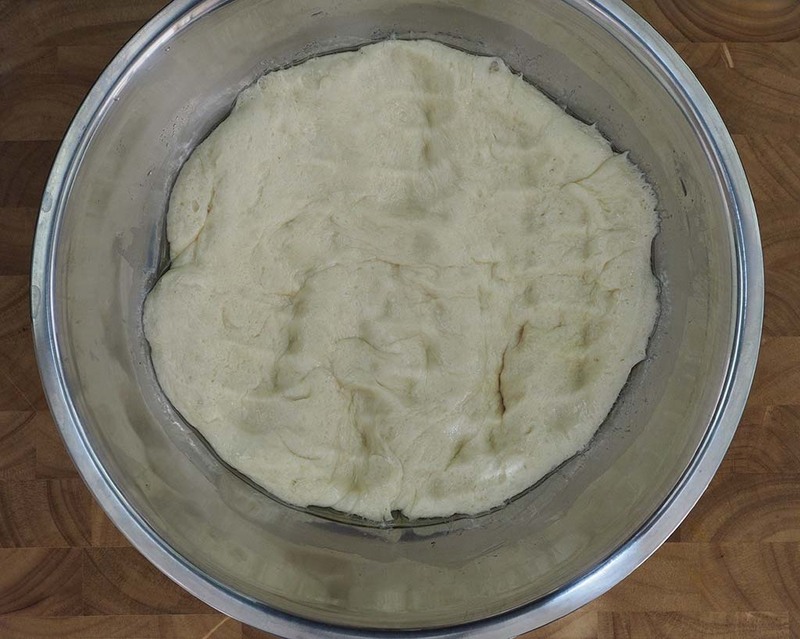 flip the dough over in the bowl so that the top of the dough is also covered in oil. Cover with cling film and place in a warm place like an airing cupboard or proving drawer for about an hour so the dough will rise. 5. Once the dough has risen, it should have roughly doubled in size. Knock back the dough by punching it so that it deflates back to its original size. 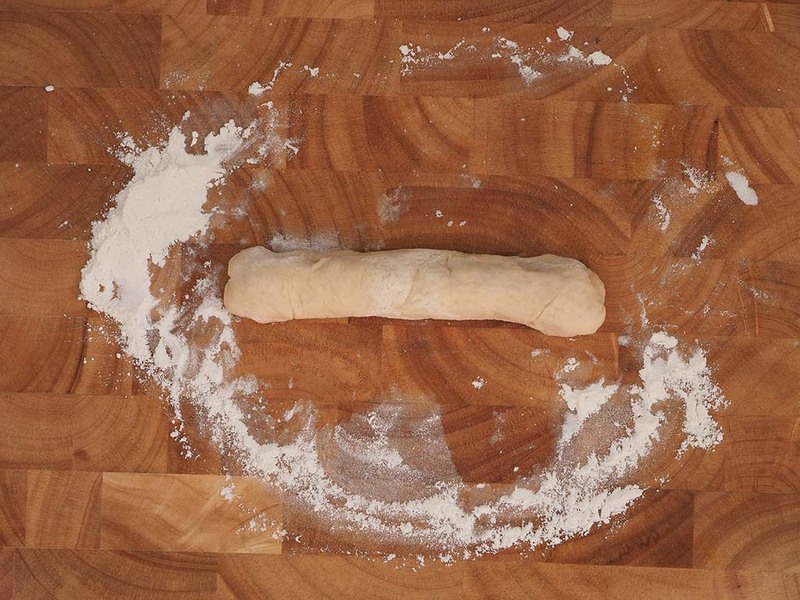 Tip out the dough onto a lightly floured work surface and kneed for a couple of minutes. 6. 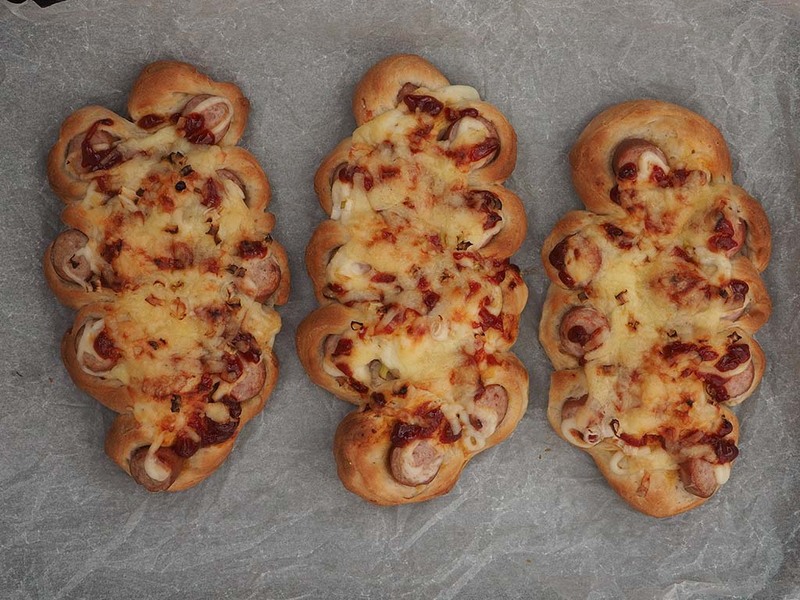 Divide up the dough into 6 or 8 equal sizes pieces (depending on how many hot dogs you have). 7. 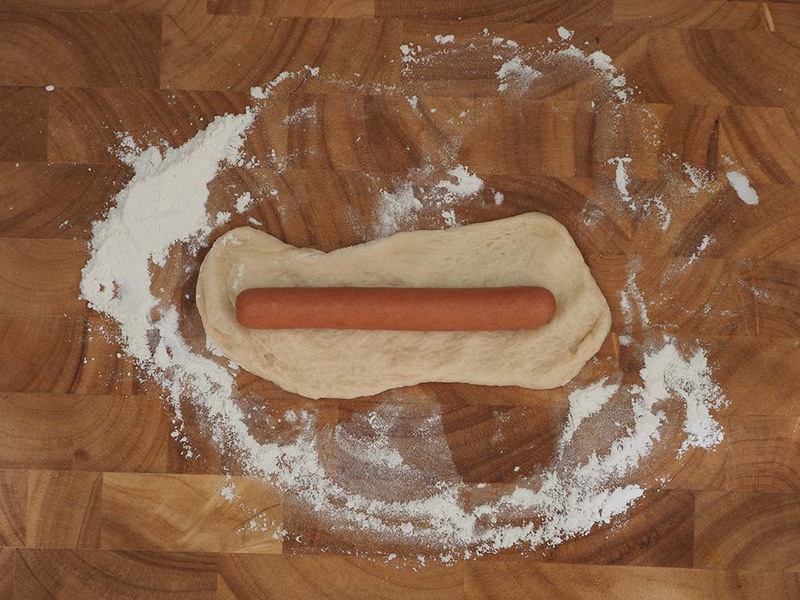 Take a piece of dough and flatten it out so that it is slightly bigger than the hot dog sausage that you are using. 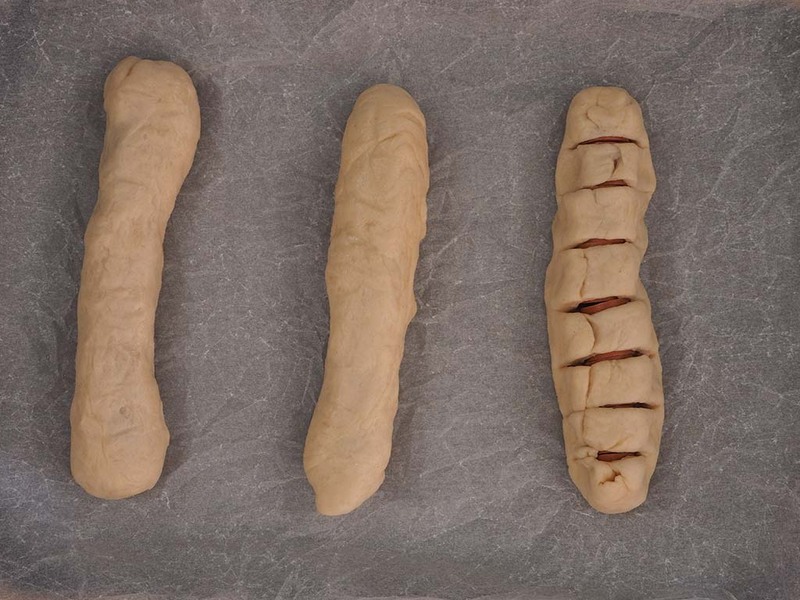 Wrap the dough around the sausage and make sure it is totally encased in the dough. 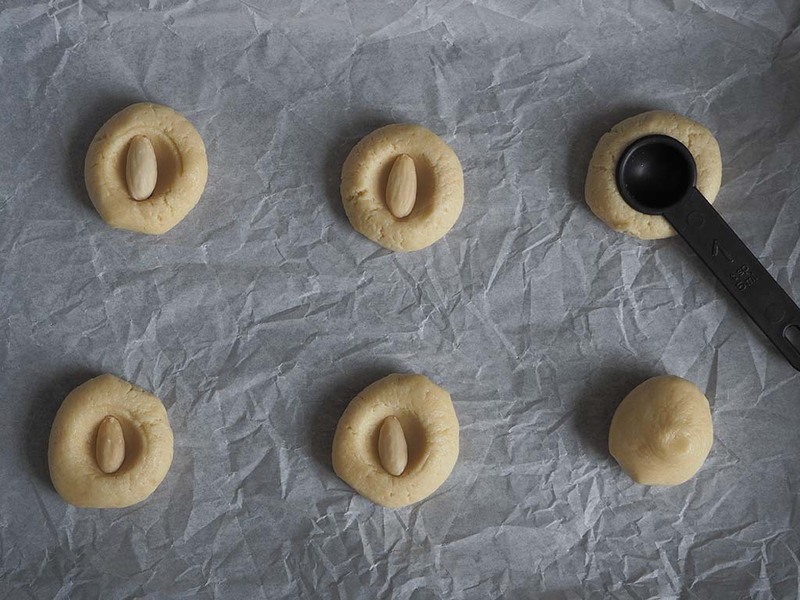 Make sure the dough casing is smooth by rolling it lightly on the surface or between your hands. 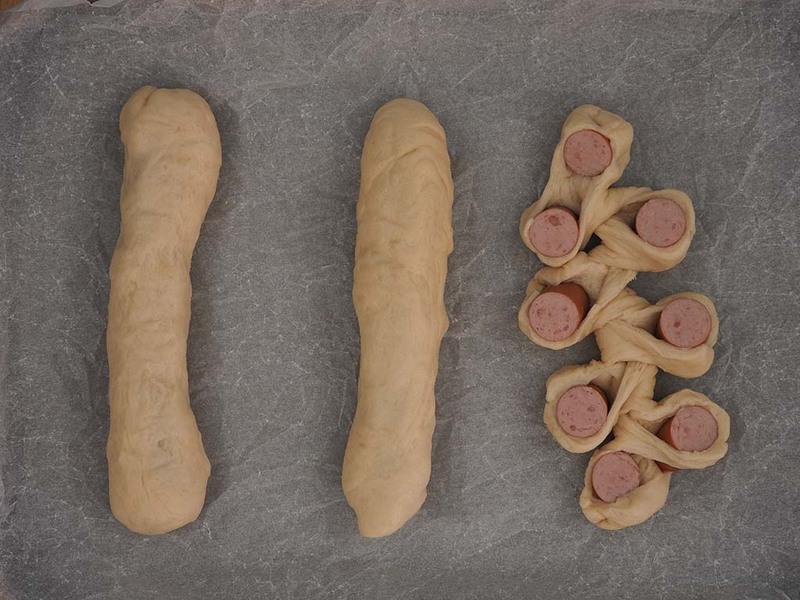 Continue flattening and wrapping the dough around the other hot dog sausages and then place them on a lined baking tray leaving a 2 inch gap between each one. 8. Take a knife and make 1cm incisions in each encased sausage BUT do not cut it all the way through as you want to leave a spine. Fan out the pieces by rotating each slice out so each alternative piece is on the opposite side of the previous one (e.g. the first one turns left, second turns right, third turns left, etc). Once all the pieces have been fanned out, twist each slice so that it is flat on the tray. 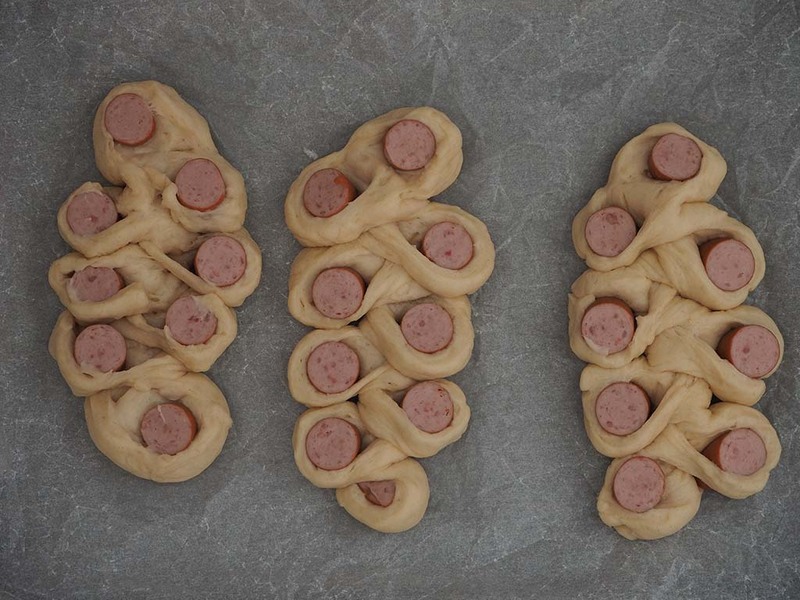 Try to twist each piece in the same direction and make sure that hot dog side is faced up on the end pieces. 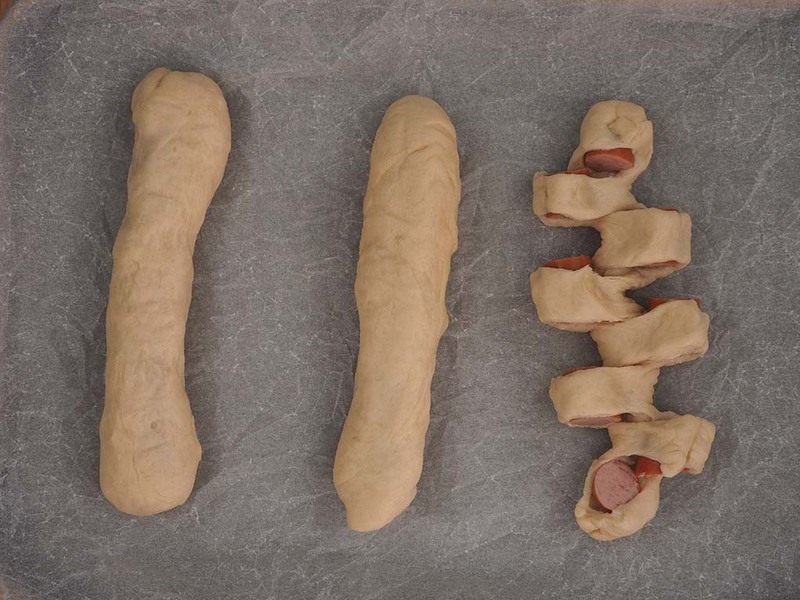 Go through the same process with the other hot dogs and cover with cling film and prove for about 45 minutes until the dough has risen and puffed up. 9. Once the dough has finished the second prove, preheat the oven to 180°C / 350°F (170°C /340°F fan oven). 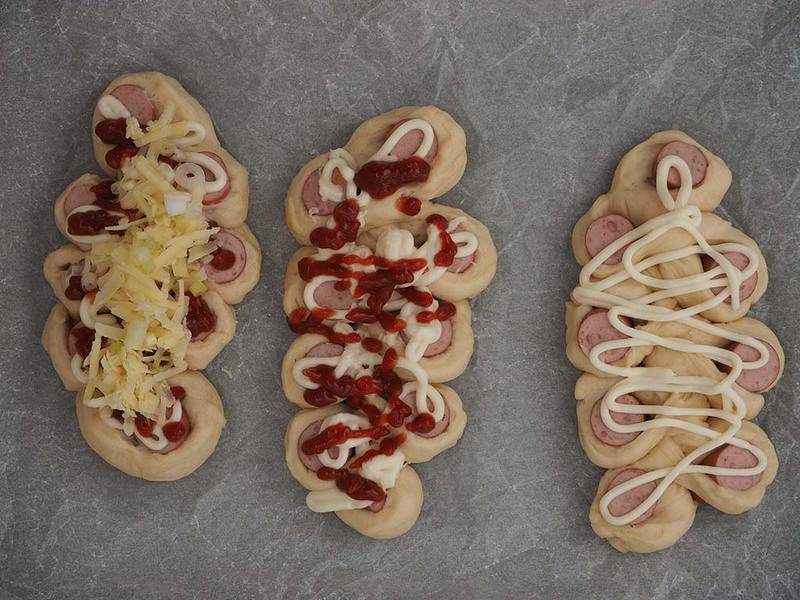 Uncover the dough and start by spreading or drizzling the ketchup and mayonnaise on top. Then sprinkle the grated cheese on top of the sauce followed by the sliced spring onion. Bake in the oven for 18-20 minutes until buns have turned golden brown. Once cooled, store in an airtight container. This post was originally posted in our Pan-Asian Kitchen blog. The text and photos by Alan. When we go into Chinatown, our trip isn’t complete without getting buns from the Chinese bakery. There are a great variety of buns to choose from but we always seem to come home with the baked char siu bao (also known as BBQ pork bun or honey roast pork bun). All of the bread products that the Chinese bakery has to offer is generally made from a single type of bread dough called Milk Bread. 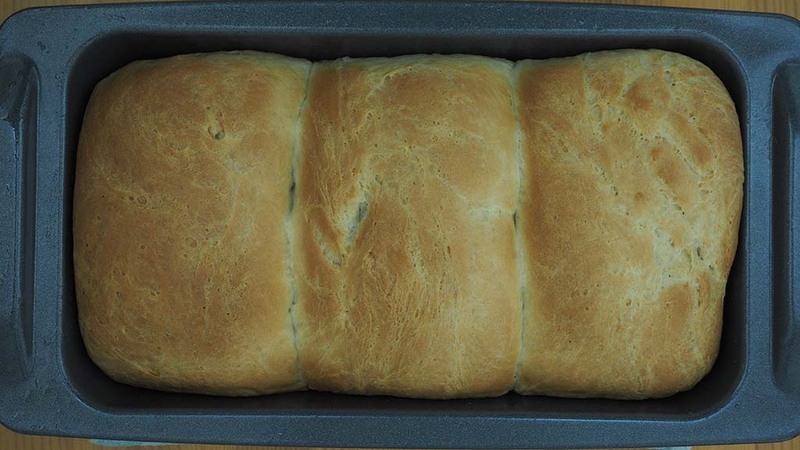 Milk bread is an enriched dough which means that it contains butter, sugar and eggs and is softer than normal breads. 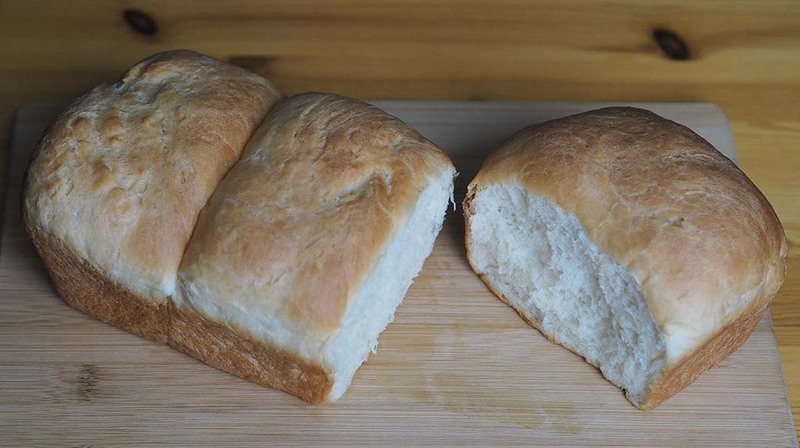 I am going to show you a basic milk bread recipe that can be made into loaves or other tasty baked treats that we will be writing about in future posts. What I love about this recipe is that it requires standard plain flour and milk rather than bread flour and cream that other recipes call for. Also, it is relatively easy to make (especially if you have a stand mixer) as there are fewer steps to follow. If you are using sachets of quick dried yeast, they will normally come in 7g packets so it may be easier to double up the recipe and do two loaves or you could even do one loaf and one of the other milk loaf recipes that we will be writing about (please follow the instructions up to step 6 to prepare the dough for those recipes). 3. 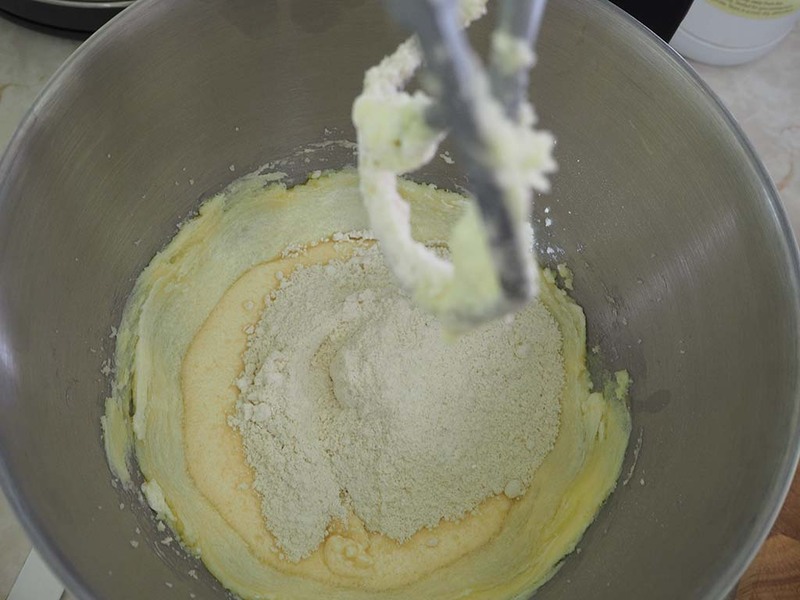 In a mixing bowl, add the yeast mixture, the butter mixture and the egg. Mix the wet ingredients together and then spoon in the flour, mixing as you go along. Keep going until all the flour has been mixed in and the mixture has turned from a batter into a dough. 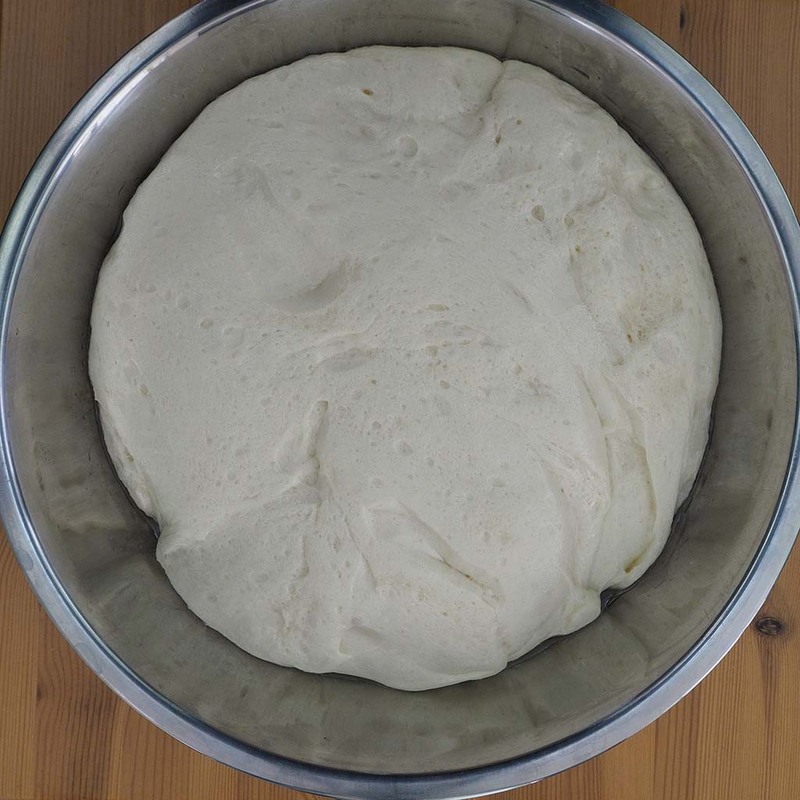 If you are working the dough by hand, tip the dough out onto a lightly floured work surface and kneed for about work the dough for about 12 minutes. 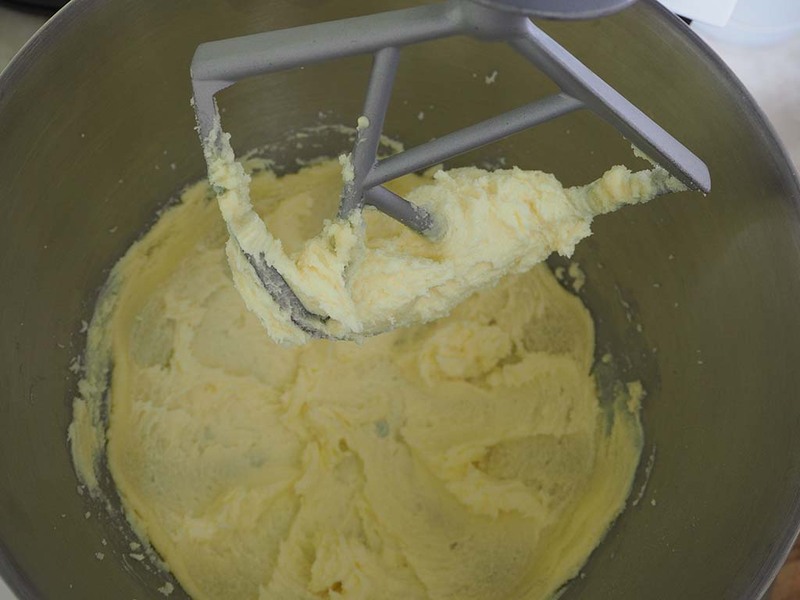 If using a stand mixer, mix for 6 minutes on a medium-low speed. The dough is ready when you can pinch some dough and stretch it quite far without the strand breaking. 5. Once the dough has risen, it should have roughly doubled in size. Knock back the dough by punching it so that it deflates back to its original size. 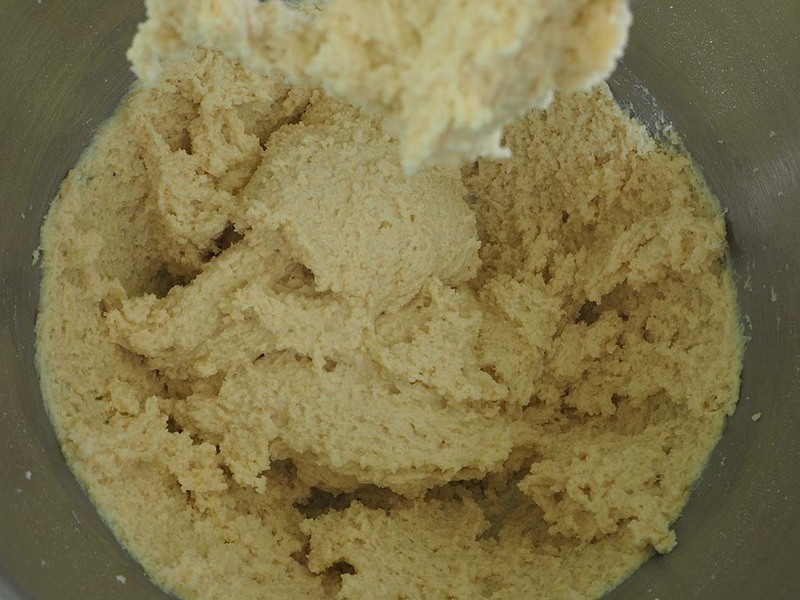 Tip out the dough onto a lightly floured work surface and kneed for a couple of minutes (If you are using this dough for one of our other recipes, the dough is ready for for filling/shaping). 6. 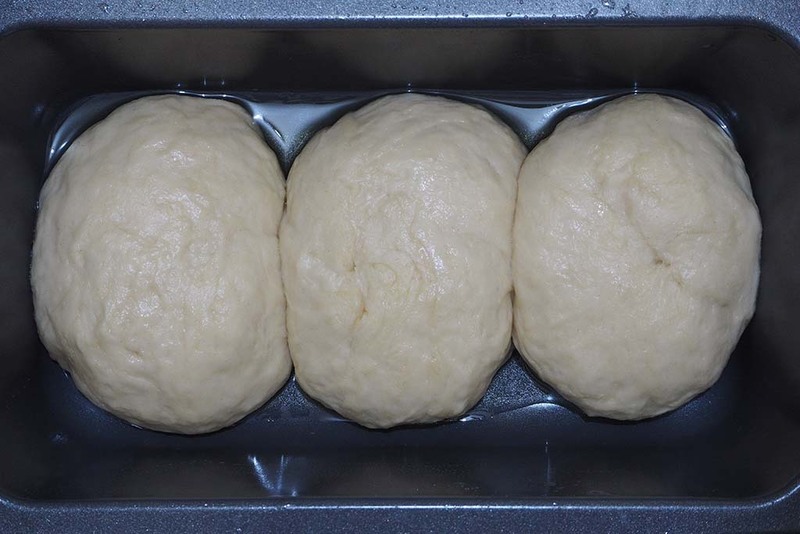 Divide the dough into three equal sized balls and roll each one in your hands until smooth. 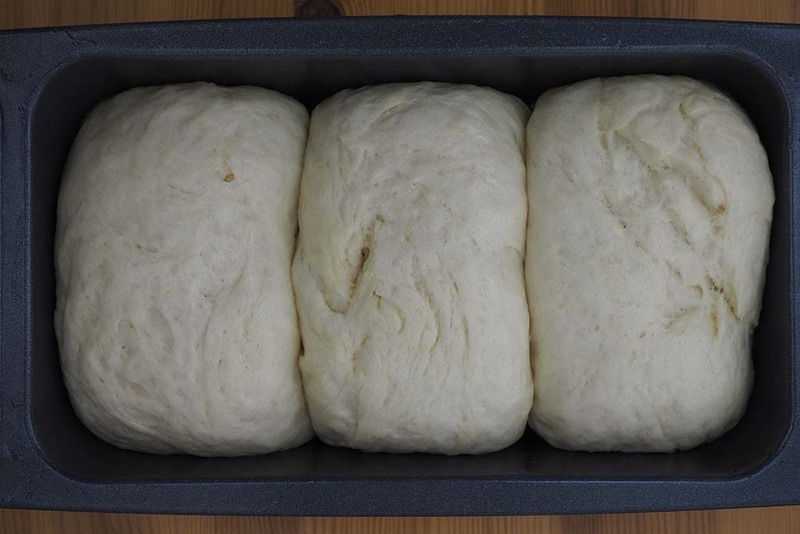 Place each dough ball into a greased 2lb loaf tin and cover with cling film. Allow the dough to prove for a further hour in a warm place where it will double in size. 7. Preheat the oven to 170°C/340°F (160°C/320°F fan oven) and bake in the oven until golden brown. Remove the loaf from the tin as soon as you can and place on a cooling rack so that the sides and bottom do not go soggy. Once cool store in an airtight container. So apparently, according to a google search, fuwafuwa means fluffy, airy, light – like a pillow or foam. A few months ago, I noticed an interesting photo on Ed T’s (@onehungryasian) instagram feed. He said he had a recipe for fluffy Japanese soufflé pancakes and I wanted to look at the recipe. I was on the verge of perfecting my version of a Japanese matcha cheesecake and I was curious about the pancakes, whether they would really be soufflé-esque. I noticed that one of the comments was this guy saying they were opening a pop-up for Japanese soufflé pancakes. I thought it would be good to find out where it was to try it so I knew what I was aiming for. I followed the Instagram account and thought I’d look through the feed later. And then I promptly forgot about it. Then Ken Mok (@kingken_photography) wrote that he finally went to try the pancakes and they looked fabulously soft and pillowy. Exactly what the name of the purveyors of these heavenly pancakes meant: Fuwafuwa. So since then, I’ve been thinking about these gorgeous pillows and wondering when I can go and taste them and find out for myself how they felt in my mouth! Yesterday, we were going to London to see a friend who was going on a trip at the end of the month and we wanted to spend time with her before she flew off on her adventures. Alan suggested we stop over at Westfield in Stratford where Fuwafuwa (@fuwafuwalondon) had their pop up shop. It was just before 9AM and on Saturdays they open from 9AM until 9PM. I was looking forward to ordering the matcha pancakes, but they weren’t on the menu. So I settled on Nutella and banana and Alan ordered S’mores. But they changed the menu at the last minute and said they had the matcha pancakes and the lovely manager of Fuwafuwa allowed me to change my order from the Nutella and banana to the Matcha Love pancakes. I absolutely LOVED them. They are as airy, soft, cloud like, light, pillowy and soufflé-esque as I built them up in my head to be. The matcha cream that accompanied my pancakes were generously flavoured with matcha and you could really taste the green tea, which I loved. They were also VERY generous with the red bean paste that was served on the side. Alan’s S’mores pancakes were yummy with marshmallows and chocolatey goodness that reminded me of childhood memories of marshmallows and chocolates melted and sandwiched between two pieces of graham crackers. Alan’s pancakes were topped with a dusting of icing sugar and a couple of pretzels. Knowing I loved pretzels, Alan very generously shared one with me! I need to know what the name of that lovely manager of FuwaFuwa is. He asked if he could take photos of our pancakes because, apparently, they were so busy that they rarely had time to photograph their heavenly creations. We, of course, obliged. I had brought my little Olympus EPL7 on this trip (I wanted to capture the cherry blossoms in London) so I was also busy snapping away with the sole purpose of posting it on Instagram. I was also determined to write about it on the blog. I offered to take photos of the pancakes with his phone. He had a surprise for us though. There was a Salted Caramel Miso and Popcorn pancake option on the menu. I loved salted caramel. I loved popcorn. I loved miso soup. I wasn’t entirely sure I wanted them all together on a plate. So I was more than a little dubious and didn’t order this particular flavour. He came back to our table and he gave us a double stack of the salted caramel miso and popcorn pancakes. To say thank you for waiting for the pancakes (they opened late) and for taking photos. It was absolutely gorgeous! It was sweet and fabulously savoury with the crunch of the popcorn for brilliant texture. I know miso was good but I didn’t know that it would be a great flavour that could be used for sweet treats as well. You learn something new everyday. Fuwa Fuwa London (@fuwafuwalondon on Instagram) is currently at their pop up at Westfield in Stratford City and according to Westfield’s website they will be open this week (16 April to 22 April) Monday to Friday from 10AM to 9PM, Saturday from 9AM to 9PM and on Sunday, 12PM to 6PM. They’ve just announced that Matcha Love will now be available on weekends too! I’d recommend going when you can and bringing a bag of patience with you because if you can’t get there early and be first in the queue, it might be a substantial wait. The pancakes are made to order and can take until 30 minutes to make and if they’re busy, the wait will be a little longer. I know 30 minutes might seem to be a bit too long to wait for pancakes, but they are very definitely worth it. It’s a heavenly party in your mouth! It’s nearly 6pm on a Sunday and I’ve had a busy day. I woke up after sleeping in, made mushrooms on toast for breakfast for Alan and me, chatted to my mum, sister and dad via FaceTime, cleared some of the mess in the kitchen and then batch cooked food for the week. I’ve got bolognese slow-cooking on the hob right now but Alan and I have had lunch already. I had smoked haddock leftover from when I made fish pie so we thought it would be a good idea to have kedgeree. We wanted a fish meal as we’d been having so many meat meals and we, well, maybe me, more than anything else. wanted a fish meal. So I dusted off my kedgeree recipe (I wrote it over 2 years ago now!) and cooked kedgeree. It was lovely and comforting and always so photogenic (aided by a strategically placed sprig of coriander). If you’d like to try your hand at cooking kedgeree, please try my version of it – the recipe is here. And if you do, please let me know how you get on!